Nepal Holiday Tour is one of the best tour packages for tourists to make their holiday fully relaxed and enjoyable. Nepal offers so many beautiful places and adventure activities to spend holiday. The mountain and nature lovers can have fantastic view of snowcapped mountains, including the view of sunrise and sunset, from the window of the hotel. Many places under holiday tour are easily accessible that require just few minutes walk from the hotel. There are many specialized massage services in some hotels and resorts to reenergize tourists. Most of the places in holiday tour package are outside the Kathmandu city. Therefore, tourists can enjoy their holiday in very peaceful environment and naturally beautiful places. Besides, holiday tour is very easy and feasible for tourists with children and elderly people. We have many different types of hotels like non-star to star and located in city area to Mountain. We provide the hotel on the requirements of guests and the cost also depends upon the category of hotel. We have many languages speaking guides like English, Chinese, German, French, Russian, Italian and Spanish. They are very sincere and dedicated on their duty and enjoy in their profession. 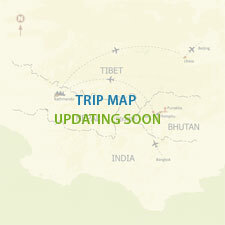 They want make happy your journey in Nepal. We provide luxury coach on the requirements of guests. The coach depends upon the number of tourists. Our drivers are highly concerned on the safety of guest. The cost of the package depends upon the number of Tourists and requirement of facalities.But for the 1 to 2 tourists we are offering the pries below.For the group we have big discount,please write us. The above costs are valid for minimum 2 pax. In Chitwan National park we provide you Nice Resort. Day 02: In the morning drive to Airport and fly to Mountain flight. 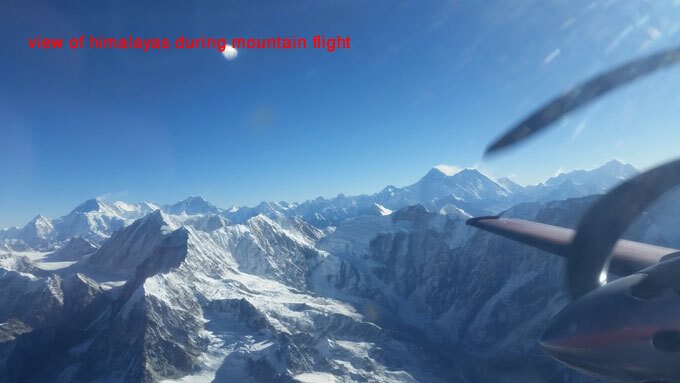 The flight is one hour and approaches close to Mount Everest (8848 meter or 28756 feet).You will see hundreds of snowcapped mountains, peaks and beautiful Mountain villages. The scenery is really breathtaking and wonderful. It will be one of the most important and memorable experience in your life. Then drive back to hotel and have breakfast. After breakfast start sightseeing and visit the wonderful Temples. Stupas, Monasteries and old Royal palaces like Pashupatinath temple (the biggest and most important Hindu temple) including cremation ground, Bouddhanath stupa and swyambhunath stupa (both are Buddhist monuments).Finally you will visit old Kathmandu durbar square including Living goddess Kumari. Then drive back to hotel. Day 03: After breakfast tour starts sightseeing and visit Patan and Bhaktapur durbar square. You will sleep in Himalaya high resort. It is about 40 minutes’ drive from City area and located on the top of the hill surrounded by dense pine forest. Day 04: Breakfast – If you like small hike you can make a hike and then drive to Pokhara. It is about 6 hour’s pleasant drive. The road is really amazing that leads along the river. Lunch is provided on the way in a river beach restaurant enjoying with the typical Nepali villages in the hills. As you arrive to Pokhara you will make small rest and walk around the beautiful Phewa Lake. Lunch is provided in a nice restaurant with big spacious garden close to Phewa Lake. Day 05: Early in the morning drive to Sarangkot to view sunrise and beautiful panoramic views of Annapurna range, Dhoaulagiri and Fishtail Mountains. Back to hotel for breakfast-free time till lunch- boating in Phewa Lake and visit Devid's fall, Gupteshor Mahadev (Lord Shiva) Cave, peace stupa, Tibbetean refugee camp and Mountain Museum. Day 06: After breakfast drive to Chitwan National park. Welcome drinks and lunch at the hotel and rest - village tour in the evening. Day 07: Breakfast - canoeing in the Rapti River - jungle walk and visit the elephant breeding center –lunch – elephant ride to the jungle and elephant bath –dinner –culture program. Day 08: Bird watching early in the morning – breakfast – departure for selected destination. Farewell dinner with Nepali cultural (music and dance) program. Canoeing is provided on the Rapti River for you to view crocodiles basking or swimming and aquatic plants in the river. In the early morning you could watch the birds. There are around 500 species of resident and migratory birds. There is more chance to see different types of wildlife through jungle drive. We can drive 35 km deep of jungle to visit the crocodile breeding centre. Our nature guide will take you deep into the park to introduce the vegetation, wildlife and the importance of the local eco system. It is an exciting program where you can grasp a glimpse of mysterious wild animals. In elephant breeding center, there are more than 20 elephants. They are 1-60 years old. June-July is the copulation season of the elephant. Close to your lodge around the national park, there is a Tharu village where you will learn and see the life style and tradition of Tharu indigenous peoples. In the culture program you will enjoy the Tharu stick dance and other cultural programs performed by the Tharu people in one of the evenings during your stay. Elephant riding into the depth of the jungle is an exciting trip to approach the wild animals, birds and plants. Elephant bathing is a unique experience. Visitors join the daily bath of the elephants that helps the elephants to scrub themselves to clean and cool down from the hit. In this program, the visitors get bathed by the elephants through their trunk.